President Trump assumed office with one of the more purposeful trade agendas in modern history: he pulled the US out of the Trans-Pacific Partnership, launched a renegotiation of the US-Korea Free Trade Agreement, and is now threatening to take the US out of NAFTA. He is also considering other measures that would reduce trade activity – most of it supposedly to reduce the US trade deficit. The US Administration needs a new trade policy strategy if it wants to keep economic growth on track and reduce the trade deficit. The most likely effect of a defensive and protectionist trade policy is that economic growth would slow and the US trade deficit would go up. In the case of NAFTA, US firms are deeply integrated into North American supply and value chains, and there is a large share of US value-added in the country’s imports from Canada and Mexico. Cutting access to the imports of intermediaries from NAFTA partners would drive up the cost of US production and cut its global competitiveness. Therefore, leaving NAFTA would reduce US exports, not only to NAFTA partners but to other markets as well. At the same time, increasing the trade costs with NAFTA partners would not lead to much repatriation of jobs to the US: it is more likely that other countries would substitute for production in Canada and Mexico that is now exported to the US. The steel sector is a case in point. Steel is an input product for construction and industrial manufacturing, and raising the cost of inputs will drive down the competitiveness of these sectors (e.g. the automotive sector), leading to blue-collar job losses. US steel protectionism in NAFTA is misplaced if the argument is that the trade deficit should be reduced: NAFTA steel trade is in balance. US steel protectionism against other exporters to the US – for instance, through a Section 232 tariff hike – is not compatible with the ambition to raise US exports. If the trade balance is your religion, free trade agreements should be your church. In other words, if the US Administration wants to reduce its trade deficit, it should rather deepen NAFTA. The rapid economic growth of India and China has obscured the more pedestrian fact that US-NAFTA trade has grown more than with any other trading partner over the past two decades. Indeed, the US needs to pursue additional FTAs. The US trade deficit with non-FTA partners is nine times higher than its trade deficit with FTA partners, reflecting the simple fact that FTAs help to open foreign markets for more US exports. Contrary to the trade rhetoric of the Administration, the US could directly improve its trade balance through additional FTAs, which would also help to build pressure on countries like China to accelerate reforms to open up its economies. Frank Lavin was the US Undersecretary of Commerce for International Trade between 2005 and 2007, and the US Ambassador to Singapore between 2001 and 2005. He is now the Founding CEO of Export Now. Hanna Deringer is Trade Policy Analyst at ECIPE, and Fredrik Erixon is the Director of ECIPE. The authors thank ECIPE colleagues Matthias Bauer for comments, and especially Julie Richert as well as Valentin Moreau for great research assistance. Whatever one might think of President Trump, he has been extraordinarily successful in upending some seventy years of trade policy, of which the United States has been the prime architect, advocate, and beneficiary. There are many elements to Trump’s policy revolution, but at the center of it is his emphasis on the balance of trade rather than the historic emphasis on open trading systems. Indeed, Trump’s substitution of equality of outcomes over the long-standing goal of equality of opportunity is almost a religious conversion in trade policy. But this stated change in policy ignores what for the anti-trade constituency is an unpleasant truth: If the trade balance is your religion, then Free Trade Agreements (FTAs) should be your church. No single policy has moved the US closer to balanced trade than the FTAs. The current US Administration is of a different conviction. President Trump does not just rail against trade agreements, he is actively seeking to undo, redo, rewrite, or withdraw from FTAs, in the name of reducing the trade deficit. This paper will examine the effect of this approach, using NAFTA and the steel industry as examples in discussing the impact of FTAs on the US economy. It will offer some general conclusions about possible next steps for the US. One of the first decisions of President Trump was to pull the country out of the Trans-Pacific Partnership (TPP). The negotiation with Europe over a Transatlantic Trade and Investment Partnership (TTIP) is in the freezer. President Trump has re-opened the Free Trade Agreement with South Korea and threatened to cancel it altogether. And at the heart of the Administration’s current occupation is the renegotiating of the North American Free Trade Area (NAFTA) with Canada and Mexico. The Administration has called for a number of NAFTA revisions that would have a negative impact on both the volume and profile of trade between Canada, Mexico and the US. Hanging over these negotiations is the threat that the US may withdraw altogether from NAFTA. It is the conclusion of this paper that pulling the US out of existing trade agreements will have a series of costs for the United States. It will reduce opportunities for American businesses; it will cost jobs; and most pertinent to President Trump’s policy goals, it is likely to expand the country’s trade deficit. The main effect of the United States withdrawing from NAFTA is likely to be a drop in both exports and imports with NAFTA partners, without much of an effect on the US bilateral trade balance with Canada and Mexico. Furthermore, the general trade deficit would likely increase. 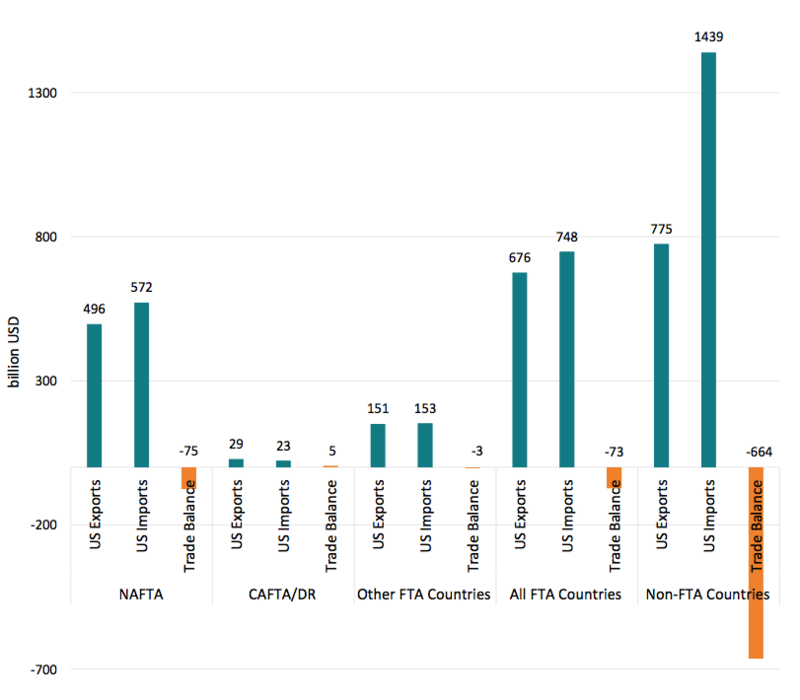 The US trade balance with its NAFTA and other FTA partners is fundamentally different from its trade balance with other key trading partners without FTAs: the US trade deficit with NAFTA and FTA partners is nine times smaller than with non-FTA partners. But the indirect damage might be even greater than the direct damage. The effect on the US trade balance would go beyond the immediate or static consequences. Importantly, if the US leaves NAFTA, it is in many ways like leaving its home market. After a quarter century with NAFTA, and strong economic integration in North America, Canada and Mexico are now virtually part of the US home market in key manufacturing sectors. Outside the field of petroleum trade, the dominant feature of trade within NAFTA is supply and value-chain trade. This means that there is a lot of back-and-forth trade over the borders and, in trade parlance, that the US imports from its NAFTA partners have a high degree of US-based value added. In addition, US industries that import input goods from Canada and Mexico in order to export to the rest of the world would see their production cost go up – and their competitiveness to fall. The key point is this: home market competitiveness and close economic ties with neighbors are component parts of a country’s global economic performance. All countries in the world show a strong degree of proximity in the way they trade with other countries: the closer countries (people) are to each other geographically, the more they tend to trade with and invest in each other’s markets. If those trade relations get significantly distorted, there will be a knock-on effect on how successfully a country competes on global markets as a large degree of today’s trade is trade in inputs. All successful trade-policy strategies therefore start with building a competitive home market and open markets with key neighbors. In other words, trade performance – like charity – begins at home. Both US importers and exporters would suffer from new trade barriers and, more importantly, the decomposition of competitive NAFTA-centered value chains. Tariffs, regulatory barriers and ‘Buy American’ policies would suppress US productivity and its international competitiveness. And for that reason, mercantilist countries outside of NAFTA do not necessarily have much to fear from a US trade strategy that is occupied by a withdrawal from NAFTA. Many other countries would regret the collapse of NAFTA and the increase in US protectionism because they would slow down trade and economic growth. But the main consequence from an isolated action such as NAFTA withdrawal would likely be a decrease in US exports to other countries in the world due to lower competitiveness of US companies. Moreover, taking away the preferential trade arrangements in North America would likely entail that non-NAFTA exports to NAFTA countries will go up. Hence, other countries would substitute the trade that now takes place inside NAFTA. In this paper, we will look closer at key aspects of US trade relations with other countries and put them in the context of the current US trade strategy, especially the threat of leaving NAFTA. The next four sections will cover the economics of current trade patterns, including a deeper look into the supply chain trade in one particular sector – steel – that has received a particular embrace by the current Administration. The final section will consider alternative ways for the US to design its trade strategy with the view of generating more economic growth and, to the extent possible, reducing the trade deficit by means of trade policy. That agenda is based on deepening NAFTA or “home market” trade while pursuing more Free Trade Agreements with countries that, like the United States, accept an open and rules-based world trading system. While the prospects for multilateral trade reforms are poor, an FTA-centered strategy would help to open markets that are more closed than the US market, and thus drive exports more than imports. Lavin, Frank. The Myth About NAFTA and Jobs. Foreign Affairs, November 2017. As the United States Trade Representative (USTR) states on its website: “trade is critical to America’s prosperity” because it promotes economic growth, creates jobs, raises living standards and provides affordable goods and services to people. The open trading system that has evolved globally since the Second World War has been a boon to US companies and workers, delivering opportunities to build stronger markets for manufacturers and services producers while lowering consumer prices. NAFTA plays an important role in that development and is now an integral part in how the US economy organizes its production. Just like in other parts of the world, regional trade in North America has grown rapidly and NAFTA countries are ever more integrated with each other. During the age of globalization, China and other emerging economies naturally became important trading partners for the US. However, NAFTA still ranks number one for US trade, both quantitatively and qualitatively, and as the profile of world trade and trade policy is becoming more regional the role of NAFTA for US trade will grow. Neighboring countries are the key trading partners because of low transportation costs and greater market familiarity. Language and historic ties often play their part as well. And for these reasons, Canada and Mexico represent a big share in US trade – 24.8% in total US trade in 2016. Moreover, their role in US trade has been increasing: In absolute value terms US trade with its NAFTA partners grew more than with the rest of the world during the past two decades. In fact, since the entry into force of NAFTA, trade between NAFTA partners more than tripled – from 290 billion USD in 1993 to more than 1.1 trillion USD in 2016. Figure 1 shows the development over time for trade in goods and services, respectively. Sources: Services trade from OECD International Trade in Services Statistics and merchandise trade from UN Comtrade data via WITS. What explains the fact that NAFTA has increased its importance for the US at a time of globalization and emerging market growth? A study by the Peterson Institute for International Economics (PIIE) breaks down the two-way trade between the US and its NAFTA partners to three different sources. One share of the trade is attributed to trade levels as they were before NAFTA and the previous Canada-US FTA. Another share of the trade comes from GDP growth and the economic expansion. Finally, the remaining ‘extra’ trade is attributed in large parts (although not exclusively) to the trade-creating effects of NAFTA. According to this study, ‘extra’ trade – i.e. the trade mainly created by NAFTA – amounted to 635 billion USD for the US, which accounts for about 55% of the US trade with NAFTA partners. NAFTA trade is crucial for the US economy also in absolute terms. For US merchandise trade, Canada and Mexico are even individually the two most important export destinations of US goods, accounting for 18.4% and 15.8% of US exports respectively in 2016. In terms of imports, Canada and Mexico are also the most important trading partners when taken together as one market, accounting for 26.4% of US imports. Only if they are counted individually, China exports more to the US than each of the two (China: 21.0%, Canada: 12.8%, Mexico: 13.6%), which is largely explained by the sheer size of China’s economy. For US services trade, which is less dependent on distance and regional supply chains, NAFTA plays a less important role with only 11.4% and 10.8% of US services exports and imports going to and coming from Canada and Mexico in 2016. Office of the U.S. Trade Representative (USTR). Benefits of Trade. Accessed at: https://ustr.gov/about-us/benefits-trade. This includes services and goods imports and exports. Calculations are based on annual trade data provided by the Bureau of Economic Analysis at the US Department of Commerce. Angeles Villarreal & Fergusson (2017). The North American Free Trade Agreement (NAFTA). Congressional Research Service Report 7-5700 R42965. Page 11. McBride & Aly Sergie (2017). NAFTA’s Economic Impact. Council on Foreign Relations Backgrounder. New York: Council on Foreign Relations. Hufbauer, Cimino & Moran (2014). NAFTA at 20: Misleading Chares and Positive Achievements. Peterson Institute for International Economics Policy Brief Number PB14-13. Washington: Peterson Institute for International Economics. Page 15. This is the case only if the EU is not counted as one single entity. The following trade data are own calculations based on annual trade data provided by the Bureau of Economic Analysis at the US Department of Commerce. The US trade deficit should not be a reason to put NAFTA trade in jeopardy. Most economists agree that the reason for the US trade deficit is neither to be found in nor to be remedied by its trade agreements. Yet, even if we would just focus on the trade balance, the picture for US trade with NAFTA is mixed, showing trade deficits as well as trade surpluses. Two observations stand out. First, the US had a total bilateral trade deficit with Mexico, but a small surplus with Canada in 2016, and Canada is the larger trading partner of the US. While the previous trade surplus with Mexico has turned into a trade deficit since the entry into force of NAFTA, for Canada it has been the other way around. The 4 billion USD trade deficit with Canada in 1994 turned into a trade surplus in the last two years, amounting to a surplus of 7 billion USD in 2016. Second, the US only has a trade deficit in goods, but has a trade surplus in services with both NAFTA partners. And in the case of Canada, the surplus in services trade outweighs the US trade deficit in merchandise trade (see Figure 2). Sources: Authors calculations based on OECD International Trade in Services Statistics and UN Comtrade, year 2016 from Bureau of Economic Analysis, US Department of Commerce. What is important to keep in mind, though, is that the US trade balance shows less of a deficit with NAFTA partners if oil and petroleum products are treated separately. The US Congressional Research Service has calculated the US trade balance with NAFTA with and without petroleum oil and petroleum products, which make up for about 10-17% of US trade with NAFTA partners over the past 10 years. 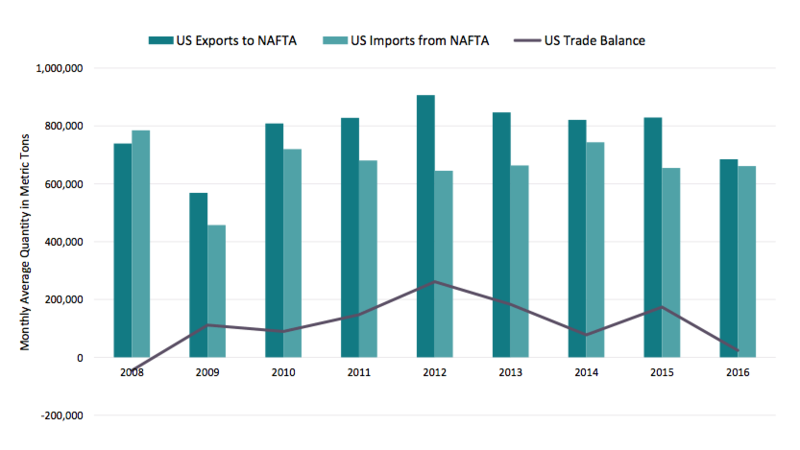 They conclude that for the remaining non-energy merchandise trade, the overall US trade balance with NAFTA countries showed much lower deficits and even surpluses in some of the years. Almost without exception, critics of FTAs tend to also be critics of trade deficits. But the history of US trade suggests a sharp contradiction between these policy goals. The US runs a goods trade deficit of approximately 5.1% with its FTA trading partners (39.1% of US trade), but it runs a trade deficit of approximately 30% with all Non-FTA trading partners. In absolute terms, the trade deficit with non-FTA partners is about nine times the size of the US trade deficit with FTA partners – and the difference between the two groups increased in 2017. Source: USITC, Trade with FTA Partners. Despite the heated criticism of FTAs, it should not be surprising that US exports to these markets show a steady rise. The US is frequently a more open market than its trading partners, so the establishment of an FTA results in disproportionate structural and transparency benefits for American exporters. Additionally, the signal effect of an FTA encourages trade missions and corporate decision-making. Third, US trading partners realize that a long-term mechanism of underpinning its access to the US market is to allow for US access to its market. The mutuality of an FTA brings predictability. Similarly, the US typically holds the status of most desirable trading partner: less bureaucratic than the EU, generally open to experimentation and novelty, and less insular than Japan or China. So the FTA negotiations allowed the US to play to its strengths as a desirable partner. Finally, as this paper illustrates below, as corporations develop deeper relations with their trading partners, broader supply chain knowledge and performance define the relationship. All parties are incentivized to seek out additional trade efficiencies. This raises the question of what the US trade balance with Mexico and Canada would actually look like today if the US had been trading with the two countries under non-preferential terms? Naturally, it would vary depending on the partner country, but for several reasons (discussed below), it is very likely that the US deficit would increase under non-preferential treatment. Schott & Cimino-Isaacs (2017). Updating the North American Free Trade Agreement. A Path Forward for NAFTA. Peterson Institute for International Economics Briefing 17-2. Washington: Peterson Institute for International Economics. Page 72. Angeles Villarreal & Fergusson (2017). The North American Free Trade Agreement (NAFTA). Congressional Research Service Report 7-5700 R42965. Page 13. Calculation in this paragraph are based on United States International Trade Commission (USITC) data for 2016: Trade with FTA Partners. The US economy not only depends on NAFTA as an export market, but also as a source for imports. Accordingly, having a trade deficit with NAFTA neighbors, from which the US is sourcing inputs for its own production, is not a bad thing for the country’s trade performance. In today’s international production processes, a country’s overall exports are also a function of its imports; without competitive (good quality or relatively cheap) imported inputs, its export products will not be competitive globally. Canada is the main foreign supplier of inputs for US exports to the world and, generally, US imports from NAFTA partners contain a high share of US inputs. The supply chain linkages between the US economy and its NAFTA partners can be discussed from two angles. First, US imports from these two partners that the US then uses for exports, i.e. the upstream linkages of the US export industries. These imported inputs make US exports more competitive because the inputs are (generally) produced at a lower cost in NAFTA partner economies. Importing them rather than buying them in the US leads to lower production costs for US export products. OECD data shows that US exports depend to a large extent on these NAFTA inputs. Figure 4 shows the origin of foreign value added in US exports as a share of total foreign value added in US exports. In total, the US is sourcing almost 15% of the value of its exports from foreign countries and the largest share of those foreign inputs are sourced from Canada. In the latest available year for trade in value added data, 14.5% of the foreign value in US exports was sourced from Canada. 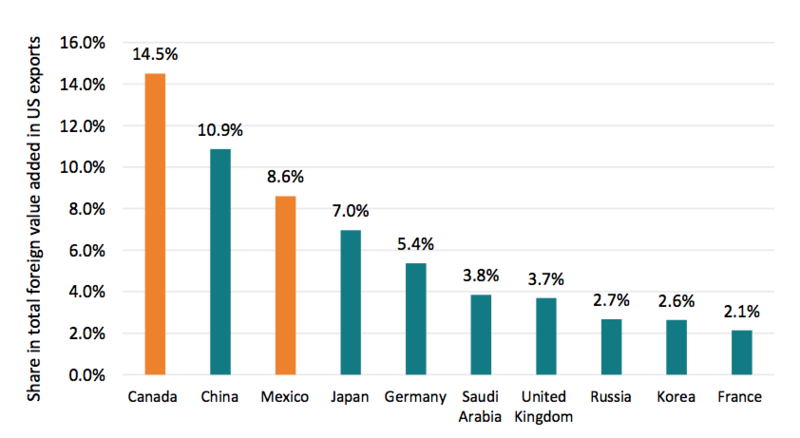 The second most important source of inputs is China followed by Mexico (supplying 10.9% and 8.6% of the foreign value added in US exports respectively). Taken together, NAFTA partners are responsible for 23.1% of US foreign value added in its exports. Source: Authors calculations based on TiVA data from the OECD (latest available year 2011). Also, if we look at the foreign value-added share of US exports in the seven largest US export industries, a similar pattern comes to view. Figure 5 shows that a significant share of that export is sourced from NAFTA partners. 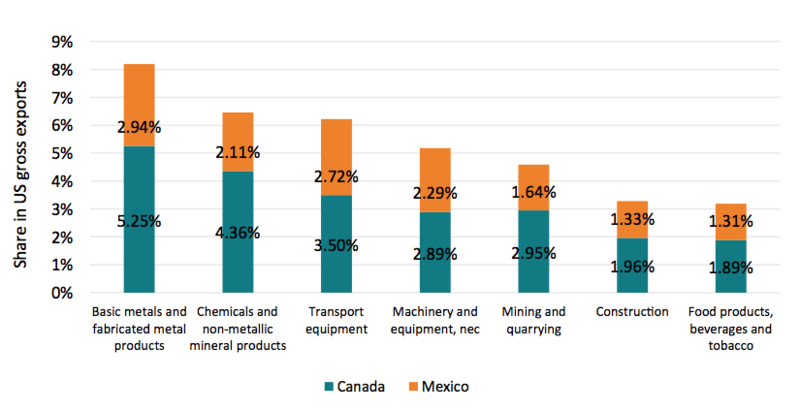 Out of the top 7 US exports industries the most dependent industries on NAFTA inputs are the basic metals and metal products sector with 8.2% of the export value coming from NAFTA partners, the chemicals industry and the transport equipment (incl. motor vehicles) sector with 6.5% and 6.2%, respectively. In all three sectors, Canada is the more important source country and makes up for the larger share of the NAFTA value added. The second part of supply-chain linkages within NAFTA is the US content that is re-imported from NAFTA countries into the US. A high US content of US imports from its NAFTA partners shows the integration of US firms in intra-NAFTA supply chains. The US International Trade Commission (USITC) found in a study of US global value chains that there is a high share of 15.7% and 14.7% of US value added in US manufacturing imports from Mexico and Canada, especially when compared to the US value added in manufacturing imports from the rest of the world of 6.4%. This shows that the US not only sources from but also supplies to NAFTA supply chains. At the same time, the high content of US value added in imports from its NAFTA partners also shows that imports are far from being harmful to US production, as they also include a substantial part of US value added. Depending on the type of trade data used in statistics and whether import figures are adjusted for re-imports, an increase in imports from Mexico and Canada can imply an increasing demand for US inputs contained in these exports. Considering NAFTA value-added in US imports, the USITC concludes that NAFTA value-added is particularly important for two sectors: motor vehicles and basic metals. With 34.8% of the value-added in US imports of motor vehicles coming from NAFTA (including the US), the share of NAFTA content was higher than for overall manufactured goods (22.1%). However, under NAFTA the added-value in US motor vehicles imports decreased more than the NAFTA-produced value added in overall US manufacturing imports. The share of NAFTA value added (including the US) in US imports of basic metals exceeded the share of NAFTA value added in overall manufacturing imports, and is even higher than that of the vehicles industry. 37.9% of US imports of basic metals contained value added from NAFTA, of which 20.4% are sourced from Canada and 12.5% from Mexico and 5% accounted for re-imported US value. Contrary to the decrease of NAFTA value in US manufacturing and motor vehicles imports, the NAFTA value-added in this sector increased from 32.5% to 37.9% between 1995 and 2011. Therefore, it is a good sector to analyze in greater detail. Flatness & Rasmussen (2017). U.S.- Produced Value in U.S. Imports from NAFTA. Office of Trade and Economic Analysis. Industry and Analysis. International Trade Administration. Department of Commerce. Page 6-7. Flatness & Rasmussen (2017). U.S.- Produced Value in U.S. Imports from NAFTA. Office of Trade and Economic Analysis. Industry and Analysis. International Trade Administration. Department of Commerce. Page 7-11. The steel sector is a ‘declared’ priority sector for the current US administration as President Trump promised during his campaign to bring back jobs to the US-based steel industry. There are good reasons to doubt that trade barriers would increase the total number of jobs in the economy, let alone how well these would be remunerated. In fact, steel protectionism – inside and outside of NAFTA – would kill more output and jobs than it creates. The steel sector is rather a good example of how protectionist measures with strong effects would destroy US exports – in both steel and steel-using sectors. It is difficult to see the argument for taking steel actions against NAFTA. NAFTA is a critically important regional market for the US steel sector – representing 90% of all US steel exports – and US manufacturing industries rely on competitive steel inputs especially from Canada, which is the main source of US steel imports. In fact, trade between the US and NAFTA partners in steel products is in balance; the US steel trade deficit is with the rest of the world. If NAFTA steel competitiveness should increase, all partners should rather be deepening the common regional market. Sources: North American Steel Trade Committee (2017). Intra-NAFTA Steel Imports. What about the rest of the world? It’s true that the US is the world’s largest importer of steel. In 2016, it imported 30.1 million metric tons of steel, which represented 19% of the steel imported globally. However, US imports have been declining since 2014, both in volume and value terms. Moreover, US steel imports don’t depend on one or a few countries, and targeting the steel trade deficit then means that the Administration would have to slap duties on steel exports from many countries. Again, the most important trade partner for US steel imports is actually Canada, representing 17% of US steel imports in 2016. Mexico follows on the fourth rank with 9% of US imports. US steel imports from NAFTA thus account for more than one-fourth of total steel imports. Hence, if new US steel protectionism would target countries that run a significant trade surplus in steel with the US, the Administration would have to go after many countries who individually represent small parts of US steel imports. Chinese steel exports, for instance, only represents 3% of total steel imports in the US. Sources: US Department of Commerce (2017). Steel Imports Report: United States and Steel Exports Report: United States. The efforts of the Administration are now focused on three main options – and they would all have a negative impact on US competitiveness and output. The first option is to increase import tariffs on steel after a US withdrawal from NAFTA, but the other two options – imposing trade defense measures and trade remedies under the Section 232 – could be imposed on trade partners independent of the outcome of the NAFTA renegotiation process. First, if the US would withdraw from NAFTA it could raise tariffs to the level of its applied most-favored-nation (MFN) tariff. However, Canada and Mexico could do the same, so the US would also face higher import tariffs in its key export markets for steel, representing almost 90% of all US steel exports. Currently, preferential tariffs on steel are zero under NAFTA. The applied MFN rates by the US are also low with a 0.5% average rate for iron and steel and 90% of the 372 included tariff lines under this heading are actually tariff free. Canada applies a zero rate on almost all steel imports from all WTO members and could only raise its tariffs on steel if it increased its applied rate towards all trade partners to its bound rate of 0.6%. The only NAFTA partner with considerable potential to increase steel tariffs is Mexico. An increase of its tariff, to its applied rate of 3.3% on a price sensitive input such as steel could seriously restrict US steel exports to Mexico where 39% of US steel products were exported in 2016. Hence, an option based on using the MFN rate of tariffs in NAFTA steel trade would likely have the direct effect of reducing US exports more than US imports of steel. Source: WTO Tariff Download Facility, 2017. Second, NAFTA partners have the right to apply antidumping and countervailing duties against each other. Hence, trade defense measures on steel could be applied independent of whether the US withdraws from NAFTA. In practice, however, countries tend to apply trade defense measures less frequently against trade partners with which they have a trade agreement. Thus, if the US withdrew from NAFTA, Canada and Mexico could not only increase import tariffs on US steel, but could also be more likely to impose trade defense measures. Finally, the US could pursue measures under the Section 232 of the US Trade Expansion Act of 1962. The Trump Administration requested the Department of Commerce to conduct investigations under Section 232 to determine if steel imports ‘threaten American economic security and military preparedness’. The assessed threats include requirements by the defense and essential civilian sectors as well as the displacement of domestic production by imports and consequent unemployment effects and reduced government revenue. The Department of Commerce presented its findings to the President on January 11, 2018. To date, there is little information about exactly what policy measures might be expected from the Section 232 investigation. The President has the power to impose trade remedies such as quotas or tariffs. According to an industry source, most predict tariffs to be the most likely remedy chosen by Trump. Furthermore, one source reports that Trump proclaimed in a June 2017 meeting with trade advisors that tariffs imposed on steel could be as high as 20%. Steel-using industries have reported on the expected adverse impacts that would result from US tariffs on steel. They also point to historical examples of steel protection that destroyed jobs. Back in 2002, the US Administration imposed 30% import tariffs on various steel imports as a safeguard measure. According to a study for the Consuming Industries Trade Action Coalition (CITAC) Foundation, more Americans lost their jobs as a result of these steel tariffs than the total number of people employed within the US steel sector. There is no reason to suppose results would be different if new steel tariffs were introduced now. To project the impact of trade restrictions on the US steel market, we used a computable general equilibrium model to simulate two policy scenarios and their impact on the US economy: (1) Potential impact from imposing MFN applied import tariffs on trade in steel and iron between the US and Canada/Mexico as a result of a withdrawal of the US from NAFTA; (2) Potential impact from a 20% import tariff on steel and iron applied by the US under the Section 232 on all steel imports, independent of the trade partner. Since the applied MFN rates on steel are very low, imposing the MFN tariff on steel imports from Canada and Mexico and vice versa is expected to not have a significant impact on US steel imports from its two NAFTA partners. Bilateral US steel imports from Mexico and Canada are estimated to decrease slightly by approximately -2.8% and -2.3%, exerting almost no impact on import prices and prices for steel inputs for US firms. Assuming, however, that under Section 232 the US Administration would introduce 20% tariffs on steel imports from all sources, this could severely impact on the US economy. Everything else being equal, aggregate steel imports into the US are estimated to fall by 33%. This would lead to a price increase for steel inputs for key US sectors like construction. For example, it would be more expensive to construct buildings, bridges and railways. Furthermore, it would also significantly affect those steel-using sectors that export, such as motor vehicles and transport equipment or machinery and other manufacturing. For them, the price increase of such a tariff for steel inputs would be in the range of 3% to 5.5%, leading to a drop in exports in these sectors between -0.6% to -3.4%. Price increases would lead to a decrease of industry output in sectors which depend on steel inputs, even if they do not export. The six US sectors whose industry output would, according to our estimates, decrease most are metal products, other metals, machinery and equipment, transport equipment, motor vehicles and other manufacturing (overall, ranging from -0.7% to -0.3%). The output loss of all losing industries in real terms would exceed by far the output increase in the steel sector. Trade protection will not help to make the US steel industry competitive in global markets. Although protectionist measures might save a limited number of jobs in the steel industry in the short run, new import restrictions will increase the price for steel consuming industries like automotive and machinery and hurt their global competitiveness. Since these industries are larger and with greater employment than the steel sector, it is unclear what advantage there would be for the U.S to save jobs in the steel sector while destroying jobs in other sectors. The following data on trade in steel products is – if not otherwise cited – based on the following two reports: US Department of Commerce (2017). Steel Imports Report: United States and Steel Exports Report: United States. Department of Commerce Global Steel Trade Monitor. Washington: International Trade Administration. US Department of Commerce (2017). Steel Exports Report: United States. Department of Commerce Global Steel Trade Monitor. Washington: International Trade Administration. Page 3. Sector defined as HS 72, HS 7301 to 7307 and HS 261800, 261900 according to GTAP Sector 35- Iron & Steel: basic production and casting. See for example: Ahn & Shin (2011). Analysis of Anti-Dumping Use in Free Trade Agreements. Journal of World Trade, volume 45, no.2, pages 431-456. US Department of Commerce (2017). Section 232 Investigation on the Effect of Imports of Steel on U.S. National Security. Bureau of Industry and Security & Office of Technology Evaluation (2007). Section 232 Investigations Program Guide. The Effect of Imports on the National Security. Washington: US Department of Commerce. Egbaria (2017). This Morning in Metals: Section 232 Tariffs to Open ‘Pandora’s Box’? Allen & Swan (ND). Trump Overrules Cabinet, Plots Global Trade War. Francois & Baughman (2003). The Unintended Consequences of U.S. Steel Import Tariffs: A Quantification of the Impact During 2002. Washington: Trade Partnership Worldwide, LLC. For details on the model and the applied methodology please see the Annex. For simplicity everything else is kept equal, no other policy changes are simulated. NAFTA is essential to the competitiveness of US firms and makes a positive contribution to the US economy. Over two decades, NAFTA has boosted US trade, GDP, investments and jobs, adding about 0.5% to US GDP, or 80 billion USD. Similarly, NAFTA had a positive impact on foreign direct investment into the US, making it a top destination for Mexican and Canadian investments. Foreign direct investment from Canada increased from 40.4 billion USD in 1993 to 269 billion USD in 2015 and from 1.2 billion USD to 16.6 billion USD from Mexico. NAFTA is also important for US jobs. While there are critics who claim that one million jobs were displaced between 1993 and 2004 due to US trade deficits with its NAFTA partners, a wealth of analyses show how the US job market has been bolstered by NAFTA trade. According to the US Chamber of Commerce, up to 14 million US jobs rely on NAFTA trade, of which 5 million are supported by NAFTA trade increases. Furthermore, it estimates that within the first four years of the entry into force of the agreement, 800,000 additional jobs were created by US manufacturing sectors. The PIIE estimates that since NAFTA entered into force, less than 5% of the job losses resulting from relocation of production can be attributed to increased imports from Mexico. For an estimated loss of 200,000 jobs per year, they argue that almost the same number of additional jobs have been created annually by rising US exports. Furthermore, they argue that for every net job lost, the US economy gained about 450,000 USD in terms of increased productivity of the workforce, a larger variety of goods and services, and lower consumer prices. Beyond job creation, other studies find that NAFTA contributed to higher salaries. Salaries in newly created jobs are estimated to be 15% to 20% higher than the salaries of jobs that were lost. Where do we go from here – and what should be the trade policy strategy of a US Administration that is determined to reduce the trade deficit? The first conclusion of this paper is that the Administration should strengthen and modernize NAFTA with the view of improving both commercial openness and rules that provide a greater role for economic freedom. By contrast, pulling out of NAFTA would hurt US competitiveness and US exports, with the risk that the US trade deficit will deteriorate. Combined with other defensive measures, such as rapidly increasing tariffs, leaving NAFTA would have a harmful effect on the sales of US firms and jobs in the US economy, and even more so if the tariff hikes include many sectors. If tariff increases cover just the steel sector, the most likely effect is that the price of construction will go up at the same time as the cost of inputs for US industrial users of steel (e.g. the automotive sector) will increase. It is highly likely that the net effect on output and jobs will be negative: some new steel jobs will be created, but at the cost of auto and other blue-collar workers. The larger point is that the NAFTA region has become a ‘home market’ for the US private sector and that trade in the North American region to a substantial degree determines the competitiveness of US firms at home and abroad. Deep patterns of specialization have already emerged and, with less freedom to trade, there will be a costly adjustment of the US economy. Substantial parts of current supply and value chains will have to be changed if the President goes ahead with anti-trade measures. Improving home market competitiveness is central to an effective trade-policy strategy vis-à-vis other countries. The US will not export more to other countries such as China if the cost of production in the US goes up and US competitiveness goes down. If the US departs from NAFTA, it is rather likely that other countries will export more to the US, partly by substituting some current Canadian exports to the US, partly by substituting US production that becomes too expensive. Re-negotiating NAFTA, however, could be an opportunity to update the agreement to the benefit of all NAFTA members, such as making it more in tune with broad economic changes since its initial agreement. An updated agreement would allow for further increases in trade, more cross-border investments and contribute to globally competitive supply chains in the region. It would make US competitiveness stronger. As NAFTA was negotiated two decades ago, various provisions are outdated and new areas for trade policies not covered. The NAFTA parts which have been identified as outdated include the chapters on dispute settlement, competition policy, government procurement and rules of origin (RoO). Revisions of these chapters are, however, still subject to political disagreement. While the current US administration is pushing for a tightening of the rules of origin, such a move would disrupt US supply chains, increase prices for consumers and decrease the international competitiveness of numerous US export sectors. Instead of a tightening of RoOs, the threshold for local content needs to be lowered, and the rules simplified and streamlined if regional supply chains are to be promoted to the benefit of all NAFTA partners. For outdated dispute settlement provisions, NAFTA could be updated along the rules included in CETA or TPP. Beyond these chapters, there are also relatively new trade policy areas which have increasingly impacted global trade relations over the past decade. For example, e-commerce, state-owned enterprises, regulatory cooperation, competition policy and trade facilitation have become key topics in international trade over the last decade. These however, remain uncovered in the current agreement. Incorporating rules related to these topics in NAFTA would broaden the scope of the agreement and help to boost trade between the US, Canada and Mexico. If the trade balance is your religion, then Free Trade Agreements should be your church. The US experience is generally that its bilateral trade balance with individual countries improve when they sign FTAs. The US economy is more open to trade than most of its trading partners, and FTAs help to make trading conditions more reciprocal, primarily by improving market access and rules in other countries. A strategy that combines improved home market competitiveness – through a modernized NAFTA, fiscal discipline, tax cuts and deregulation – with new FTAs would most likely have the effect of reducing the total trade deficit of the US. Furthermore, it would also be a powerful strategy for improving the terms of economic competition with economies like China – state-oriented economies that have a significant trade surplus with the US. It would go to show that US-led efforts to improve market access and rules outside the WTO can be costly, economically and politically, for countries with high trade barriers and that distort competition by means of state interventionism. A country like China has little to fear from a US trade policy strategy that reduces North American competitiveness; such strategies will only improve China’s relative competitiveness. However, a US trade policy strategy that gives a premium to countries that commit to higher standards for market access and rules against market distortions will have the opposite effect: it will reduce China’s relative competitiveness and provide additional economic arguments for further and deeper market reforms in China. Such a US strategy should start by re-activating the trade negotiation with the European Union and finding a role in the revamped TPP structure. A deal with the European Union is important to cut the costs of trade for many larger US multinationals and to set new rules on how to deal with anti-competitive measures by governments, e.g. state-owned enterprises, in the global economy. Re-engaging with TPP partners – which, in most cases, the US already have bilateral trade deals with – have a similar motivation: to improve market access for US firms in the Pacific region and to establish new rules against anti-competitive government policies. Other Free Trade Agreements will flow from such a strategy, but deals with the EU and TPP partners will help to set new standards for market access and rules in future trade agreements. The US economy has everything to win from a development where trade agreements go deeper and are reinforced. In most examples, other countries enjoy better market access to the US economy than vice versa. What the US economy would lose from, however, is a new trade policy that increases the cost for US companies to compete successfully at home and abroad. Angeles Villarreal & Fergusson (2017). The North American Free Trade Agreement (NAFTA). Congressional Research Service Report 7-5700 R42965. Page 16. Lester, Manak & Ikenson (2017). Renegotiation NAFTA in the Era of Trump: Keeping the Trade Liberalization in and the Protectionism Out. Cato Working Paper No. 46. Washington: Cato Institute. Page 1. Scott, Salas, Campbell & Faux (2006). Revisiting NAFTA- Still Not Working for North America’s Workers. Economic Policy Institute Briefing Paper #173. Washington: Economic Policy Institute. Page 3. US Chamber of Commerce (2015). NAFTA Triumphant: Assessing Two Decades of Gains in Trade, Growth and Jobs. Page 1. Hufbauer & Cimino-Isaacs (2014). NAFTA Rejoinder: The US Effects are Clearly Positive for Most Workers (Part II). Peterson Institute for International Economics Realtime Economic Issues Watch. Washington: Peterson Institute for International Economics. Hills (2014). NAFTA’s Economic Upsides- The View from the United States. Foreign Affairs Essay. January/February 2014 Issue. Cited in McBride & Aly Sergie (2017). NAFTA’s Economic Impact. Council on Foreign Relations Backgrounder. New York: Council on Foreign Relations. See for example: Ortiz-Mena (2017). Toward a Positive NAFTA Renegotiation: A Mexican Perspective. A Path Forward for NAFTA. Peterson Institute for International Economics Briefing 17-2. Washington: Peterson Institute for International Economics. Page 30.
or Lester, Manak & Ikenson (2017). Renegotiation NAFTA in the Era of Trump: Keeping the Trade Liberalization in and the Protectionism Out. Cato Working Paper No. 46. Washington: Cato Institute. Page 6. Bergsten & de Bolle (2017). Overview. A Path Forward for NAFTA. Peterson Institute for International Economics Briefing 17-2. Washington: Peterson Institute for International Economics. Page 7. For example, products manufactured in the CAFTA/DR nations could be counted towards NAFTA RoO requirements, thus slightly expanding the concept of Home Market. Dobson, Tory & Trefler (2017). NAFTA Modernization: a Canadian Perspective. A Path Forward for NAFTA. Peterson Institute for International Economics Briefing 17-2. Washington: Peterson Institute for International Economics. Page 43. Lester, Manak & Ikenson (2017). Renegotiation NAFTA in the Era of Trump: Keeping the Trade Liberalization in and the Protectionism Out. Cato Working Paper No. 46. Washington: Cato Institute. Page 2. Ahn & Shin (2011). Analysis of Anti-Dumping Use in Free Trade Agreements. Journal of World Trade, Volume 45, No.2, pages 431-456. Angeles Villarreal & Fergusson (2017). The North American Free Trade Agreement (NAFTA). Congressional Research Service Report 7-5700 R42965. Allen & Swan (ND). Trump Overrules Cabinet, Plots Global Trade War. Accessed November 2017. Bergsten & de Bolle. Overview. In Bergsten & de Bolle (eds.) (2017). A Path Forward for NAFTA. Peterson Institute for International Economics Briefing 17-2. Washington: Peterson Institute for International Economics. Dobson, Tory & Trefler. NAFTA Modernization: a Canadian Perspective. In Bergsten & de Bolle (eds.) (2017). A Path Forward for NAFTA. Peterson Institute for International Economics Briefing 17-2. Washington: Peterson Institute for International Economics. Egbaria (2017). This Morning in Metals: Section 232 Tariffs to Open ‘Pandora’s Box’?. MetalMiner, Industry News. Accessed November 2017. Flatness & Rasmussen (2017). U.S.- Produced Value in U.S. Imports from NAFTA. Washington: Office of Trade and Economic Analysis, Industry and Analysis, International Trade Administration, Department of Commerce. Hufbauer, Cimino & Moran (2014). NAFTA at 20: Misleading Chares and Positive Achievements. Peterson Institute for International Economics Policy Brief Number PB14-13. Washington: Peterson Institute for International Economics. Hills (2014). NAFTA’s Economic Upsides- The View from the United States. Foreign Affairs Essay, January/February 2014 Issue. Cited in McBride & Aly Sergie (2017). NAFTA’s Economic Impact. Council on Foreign Relations Backgrounder. New York: Council on Foreign Relations. Lavin, Frank (2017). The Myth About NAFTA and Jobs. Foreign Affairs, 14 November 2017. Lester, Manak & Ikenson (2017). Renegotiation NAFTA in the Era of Trump: Keeping the Trade Liberalization in and the Protectionism Out. Cato Working Paper No. 46. Washington: Cato Institute. Office of the U.S. Trade Representative (USTR) (ND). Benefits of Trade. Accessed November 2017. Ortiz-Mena (2017). Toward a Positive NAFTA Renegotiation: A Mexican Perspective. In Bergsten & de Bolle (eds.) (2017). A Path Forward for NAFTA. Peterson Institute for International Economics Briefing 17-2. Washington: Peterson Institute for International Economics. Schott & Cimino-Isaacs (2017). Updating the North American Free Trade Agreement. In Bergsten & de Bolle (eds.) (2017). A Path Forward for NAFTA. Peterson Institute for International Economics Briefing 17-2. Washington: Peterson Institute for International Economics. Scott, Salas, Campbell & Faux (2006). Revisiting NAFTA- Still Not Working for North America’s Workers. Economic Policy Institute Briefing Paper #173. Washington: Economic Policy Institute. US Chamber of Commerce (2015). NAFTA Triumphant: Assessing Two Decades of Gains in Trade, Growth and Jobs. Washington: US Chamber of Commerce. US Department of Commerce (2017). Steel Imports Report: United States and Steel Exports Report: United States. Department of Commerce, Global Steel Trade Monitor. Washington: International Trade Administration. US Department of Commerce (2017). Section 232 Investigation on the Effect of Imports of Steel on U.S. National Security. Department of Commerce, Global Steel Trade Monitor. Washington: International Trade Administration. Accessed November 2017. United States International Trade Commission (USITC) (2003). The Impact of Trade Agreements: Effect of the Tokyo Round, U.S. Israel FTA, U.S. Canada FTA, NAFTA, and the Uruguay Round on the U.S. Economy. Publication 3621. Cited in Angeles Villarreal & Fergusson (2017). The North American Free Trade Agreement (NAFTA). Congressional Research Service Report 7-5700 R42965. The general equilibrium model simulation is conducted with the standard GTAP Model by the Global Trade Analysis Project (GTAP) at the Purdue University. The model is a static comparative model and has been applied frequently in studies about impacts of trade policy and trade agreements. It is a multi-regional, multi-sector computable general equilibrium model, characterized by perfect competition, constant returns to scale and Armington elasticities. The standard model assumes full mobility and employment of factors of production, i.e. all factors of production including labor will adjust until they are fully absorbed after the policy change. We use the default macro-closure which applies a savings-driven model, i.e. the savings rate is exogenous and the investment rate will adjust. The standard GTAP Model does not account for endogenous productivity growth and may thus under- or over-predict changes in welfare, investment, economic output and trade volumes that result from trade policy changes. Like any applied economic model, the model is based on a number of assumptions which simplify the complex policy framework governing the economy in reality. The results of the estimations therefore only have indicative character as it is not possible to forecast the precise impact of changes in trade policy variables on macro-economic variables, mainly due to lack of empirical data, the influence of too many different factors and non-constant causal relationships. As base data we use the most up-to-date GTAP 9 database, which was released in May 2015. The database contains global trade data for the years 2004, 2007 and 2011 based on input output tables and trade protection data. The GTAP 9 dataset on the global economy is extrapolated to 2016 to reflect the “best estimate” of the global economy today. Estimations are taken from the well-recognized database of the French Research Centre in International Economics (CEPII), as is documented by Fouré et al. (2012). As described in the text we have modeled two different scenarios: (i) the US withdraws from NAFTA and applies MFN tariffs on imports in “Iron & Steel: basic production and casting” (GTAP sector 35) from Canada and Mexico, as well as these two trade partners apply MFN tariffs on their imports from the US; (ii) the US applies a 20% import tariff on its imports in this sector from all trade partners as a result of a Section 232 investigation. For simplicity and to isolate the effects of such sector-specific measures we do not apply any other policy changes. This caveat needs to be taken into account for the first scenario under which the US would also apply MFN tariffs on other economic sectors which would also have an effect on and be interlinked with the impacts on the steel and iron sector. The tariff averages applied for the first scenario were calculated based on US applied MFN import tariffs for 2017 from the World Trade Organization’s (WTO) Integrated Database (IDB). The calculated tariff average rates include HS 72, HS 7301 to 7307 and HS 261800, 261900 according to GTAP Sector 35.